The Pokémon TCG and Video Game Latin America International Championships are the first International Championships event of the 2019 Championship Series season. It's sure to be one of the largest Pokémon Championship Series tournaments, and it features exciting competitions for both Pokémon TCG and video game players. This season's event will take place at the Centro de Eventos PRO MAGNO in São Paulo, Brazil, on November 16–18, 2018. 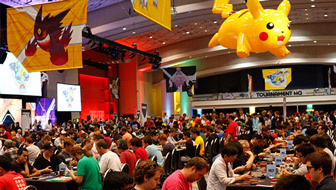 It will feature high Championship Point payouts and thousands of dollars' worth of prizes, spread between the Pokémon TCG and video game competitions. The Pokémon Company International is excited to work with Copag as the operator of the event. Information on registration and event organization is available on the Copag website. The Masters Division competitions will begin Friday, November 16, and go through Sunday, November 18. Junior and Senior Division competitions will begin Saturday, November 17. Tune in to watch exciting matches live from São Paulo, Brazil, at the Pokémon Latin America International Championships from November 16–18, 2018, on Twitch.tv/Pokemon and Twitch.tv/PokemonTCG. The two streams will feature Pokémon video game and Pokémon TCG matches on Friday, November 16, and Saturday, November 17. Then, watch Twitch.tv/Pokemon on Sunday to catch every Pokémon TCG and video game finals match. Expert commentators will help you follow along with the action. Get details on Latin America International Championships live streaming.